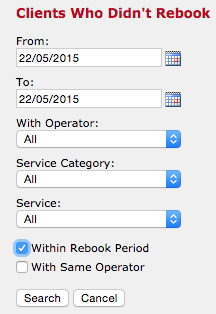 Set your Target Rebook Period so that you can target client's haven't rebooked within your targeted time frame. By encouraging clients to rebook sooner rather than later means better routine for them, and more business for you. The idea is to encourage your client's to book within your Target Rebook Period to keep your clients coming in on a regular basis. Go to Settings, then into Marketing Settings and enter in the number of weeks you want your Target Rebook Period to be, and Save. We've chosen 8 weeks because this is generally the time frame in which your clients should rebook within. Let's say that you have set your Target Rebook Period to 8 weeks. Go to your Marketing page and click the the Clients Who Didn't Rebook option in Marketing. On the right side panel change the dates to when the clients came in for their appointments, and tick the Within Target Rebook Period option, click Search. This is going to show you all of the clients who came in between those dates, but who didn't rebook within 8 weeks of that appointment. Here are your clients who came in between the date range you selected, but who did not rebook within your Target Rebook Period (8 weeks). You can now SMS or email these clients encouraging them to book in earlier next time. Perhaps send them an offer as an incentive to book within 8 weeks after their next appointment. This kind of analysis means that you can target the clients who rebooked outside of the 8 weeks and encourage them to rebook more regularly ?within your Target Rebook Period. The more regularly they are coming back to see you, the sooner it becomes their routine and the more your business benefits.